Relatively easy to get to, nice beaches, two endemic white-eyes, a monarch and a coucal. Can’t say better than that, can you? Unless you arrive by slow boat from an even more obscure destination, your are likely to arrive first in Kai Kecil. This is one of the two main islands that make up the Kai group. Kai Kecil is around 50km long and less than 20km wide. It is formed from uplifted coral, meaning it is generally flat and very dry. The natural vegetation is relatively dry forest and this remains in many places, albeit it in fairly degraded condition. In other places scrub and grassland now dominate. Of the birds that are endemic to Kai, all but one (Great Kai White-eye) can be found pretty easily on Kai Kecil. Birding here is mostly just a case of finding patches of forest and exploring. Even the most scrappy looking patches of roadside forest can support all the birds you are looking for. A popular birding option is the coastal strip north and east of the village of Ohoililir (also known as Pasir Panjang), especially easy if combined with staying at the delightful ‘Coaster Cottages’. To get here take the beach track north of the village until the end (at Coaster Cottages) and then on foot take the indistinct path which heads north through forest for around 1-2km. Numerous side trails head inland from the coast track, usually meeting a steep coral ridge about 100m inland. It is possible to climb this and then continue on even more indistinct paths on the ridge. Alternatively, a more distinct path heads inland just before Coaster Cottages, climbs the ridge, and then heads east through dry forest. The forest in this general area supports Kai Coucal, the cuckoo-shrikes, White-tailed Monarch, Island Whistler (it seems far easier to see this small island specialist on Kai than anywhere else), Little Kai White-eye and Yellow-bellied White-eye (another small island specialist). Australian Figbird (surely that should be ‘Kai Figbird’?? 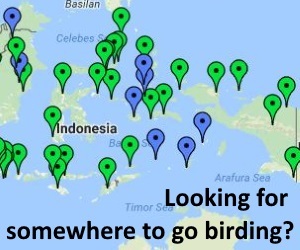 ), Orange-footed Scrubfowl and Cinnamon-chested Flycatcher have also been seen in this area, as has Tanimbar Corella (of unknown provenance). Outside of this well visited area the tactics are much more freestyle! One nice option is simply to hire a motorbike from someone and explore the many small tracks and roads that cross the island (or do the same with Ojek or Bemo). Just South-east of Ohoililir an interesting track follows the coast east, starting at a large mud-flat (which can support many waders in season) and then passing through many small forest patches. Birds that can be seen anywhere along this track include Kai Coucal (especially early morning), Kai Cuckoo-shike, Yellow-capped Pygmy Parrot, Australian Figbird, Little Kai White-eye and White-tailed Monarch. After about 2 km on the coast track take a left (inland) and then park about 1km further-on; where a fairly well define footpath drops down to the left. Following this brings you to an interesting freshwater lake and some good birding in the surrounding forest. The lake can support Little (‘Tricoloured’) Grebe, Spotted Whistling Duck, Green Pygmy Goose and Common Coot. The forest around the lake has all of the endemics of Kai Kecil. This could also be a good place to try looking for the elusive (and potential split) Southern Boobook. Many drivers (Ojek & Bemo) will know where this lake is, so you can also ask people to take you here. Other options for finding forest include the road north of Tual (on a smaller island known as Kai Dullah). Here you can try heading for a spot called ‘Taman Angrek’ just east of the village of Dullah, or take to the tracks and paths behind this into whatever patches of forest you can find. Birds that have been seen in this area include all of the above. Take a read of a few of the trip reports listed below for more info about this area. Another area that looks interesting (on Google Earth, at least) is the peninsular north of Kai Kecil’s highest point – Bukit Masbait. It appears that a number of tracks pass through good condition looking forest in this area. Kai Besar is a complete contrast to Kai Kecil: It is long , thin and entirely covered in steep hills reaching to around 700m asl. As a consequence it supports much more extensive forest. Currently only one endemic is recognised for Kai Besar -Great Kai White-eye – but this could change if the local race of Island Leaf Warbler (seemingly only found on Kai Besar) is elevated to species. The local race of Slender-billed Cuckoo Dove is also another split candidate which is much more numerous on Kai Besar. The more extensive dense forest also makes Kai Besar a better place to look for the difficult-to-find Cinnamon-chested Flycatcher. Kai Coucal, the figbird and the monarch are also present on Kai Besar, so it is only really Little Kai White-eye that you can’t see here! If you are just looking for the white-eye on a flying trip from Kai Kecil then a couple of easy options include getting an ojek to take you onto either of the surfaced cross-island roads; to Yamtel (closest to Elat) and to Fako (a little further north). As soon as you get into degraded forest (mixed with farmland and fruit trees) get off and walk and it should not be long before you find the white-eye, which seems to be present across pretty much the entire altitudinal range. If you are planning to stay a night or two on Kai Besar then a great place to spend some time birding is the high land north of the Fako road. Here there is a place known as ‘Bukit Indah’ that ojek drivers will know. To get here follow the Fako road up to around the highest point and then just before it starts to drop down to the east coast get off where you see a concrete arch on the left and a sign marking the track to ‘Bukit Indah’. Following this track takes you through degraded forest to a clearing with a grotto-kind-of-thing and big concrete statue of Jesus. Just behind Jesus a well marked trail heads up hill into nice condition forest. Several side trails branch off this trail, and you could happily spend many hours in here. 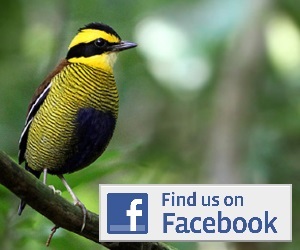 Birds that have been seen around Bukit Indah include all the ones mentioned above, including the warbler and flycatcher. The area is also very good for parrots. The mature hill forest also holds Stephan’s Dove, which is kind of interesting as Kai Besar also supports Emerald ‘Green-winged’ Dove (more common in degraded forest at lower altitude) meaning you can see both species in a short space of time and compare them! Further afield, northern Kai Besar supports the most extensive forest areas on the island but the access would always likely include a long walk up from the coast. To try this area simply pick a coastal village near wherever looks interesting and then head in. Getting to Kai Kecil is very easy by Maluku standards. At time of writing there are at least three scheduled flights a day from Ambon (Wings Air and Trigana). These land at the small airport at Langgur/Tual. There are several accommodation options in town (check out Lonely Planet) but the nicest option is probably to take the 30 min ride to either Ohoililir (for Coaster Cottages) or Ohoidertawun (for Savanah Cottages). The birding is better here, and cold beers watching sunsets on the beach is also pretty nice! Check out a guide like Lonely Planet for more up-to-date info. Getting around the island is as easy as chartering a car/bemo, using ojeks (motorbike taxis) or hiring a motorbike from someone (ask at your accommodation). Getting to Kai Besar is slightly less straightforward. There are three boat options, all leaving from Tual/Langgur and heading to Elat on Kai Besar. These include: 1) Speedboats (fibreglass tube, over-filled with people, and 3-4 large outboard motors). These generally leave when full but the first will normally go around 8-9am. There may, or may not, be a later boats depending on demand! 2) Kapal Cepat (larger fibreglass boat with airplane-style seating, and karaoke). This seems to leave Kai Besar first, so would leave Kai Kecil to return sometime in the afternoon? 2) Kapal Kayu (bigger wooden boats). Mostly for those people planning to move large amounts of cargo around, slowly! Getting back from Kai Besar means getting the ‘Kapal Cepat’ in the morning, or hoping for a later speedboat. Be warned, however, that if demand is light there may not be a later speedboat. Alternatively, if demand is high, the speedboat may have left well before the time that was suggested to you! Failing all these, you can try and charter a boat. What this costs you will depend on what you charter, but expect to have to pay $100+. If you decide to stay on Kai Besar, or simply find yourself stranded by the above boat arrangements, then there is a nice basic hotel (penginapan) on the right as you head into town from the port. Away from Elat there are no formal accommodation options. There are a few restaurants in Elat, although they all close very early in the evening. Ojek is the best (and maybe only) option for getting around on Kai Besar.